Say Hello to Matt Peppmuller! 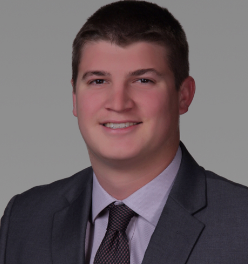 Graduating with an undergraduate degree in Accounting from UNL in December of 2015, Matt is our new Finance Intern. Growing up, Matt attended Kahoa, Mickle, and graduated high school from Lincoln Northeast. Going through these 3 schools is the reason he is excited to work for FLPS! He is very appreciative of the teachers, administrators, and peers he met through his time at LPS and looks forward to reconnecting with those people during his time here at the Foundation! Matt recently started graduate school at UNL with hopes of receiving a Masters in Professional Accountancy in the Spring of 2017. He will then be studying to take his CPA exams in the Summer of 2017. This past spring Matt had an internship at BKD LLP (In Lincoln) working in their Tax Department, and he accepted a full-time Tax position there starting in September of 2017. Matt is currently engaged and will be getting married in June 2017. His fiance works for LPS as a 2nd grade teacher at Clinton Elementary. He also works at HiMark Golf Course in Lincoln and enjoys playing golf in his free time!